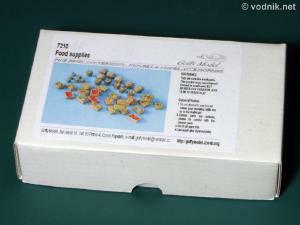 Among samples of various resin sets I received from Czech Goffy Model company was one rather unusual. 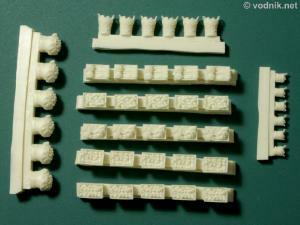 Most sets contained military accessories and parts, but this one is 100% civilian, although it can still be quite useful for military diorama. 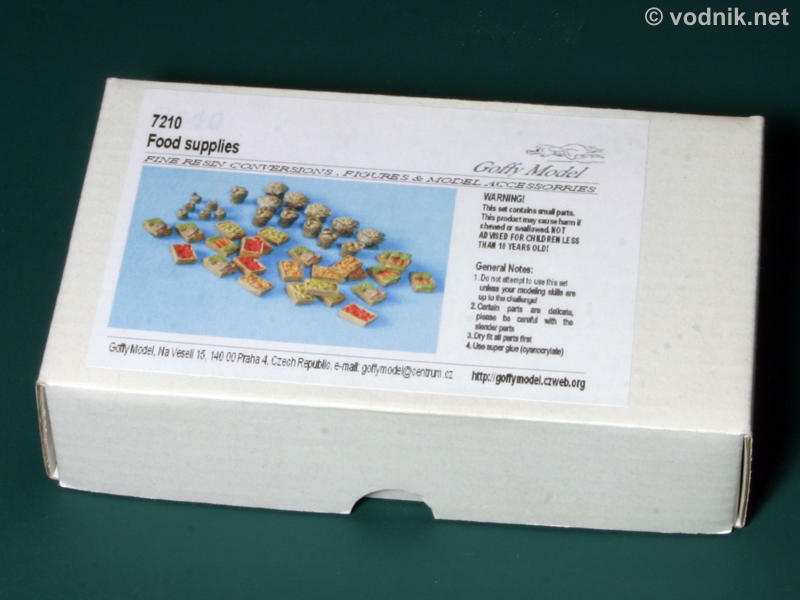 In this set we get various food products in crates, baskets and sacks in 1/72 scale. The set comes packed in a neat cardboard box with a photo of painted contents of the box on what an inkjet printed label. Inside a box is a single resealable zip-bag with all resin parts inside. In the set we get 25 crates with a variety of fruits and vegetables in them. In this scale it is difficult to unambiguously identify them, but I think there are some apples, carrots, lettuces, cabbages and others there. And you can easily change e.g. 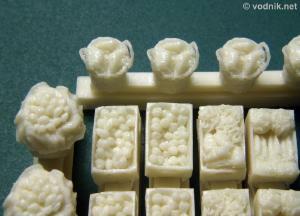 carrots to parsleys, just by changing the color you use to paint them, so it all depends on a modeler. Aside from crates, included in the set are also six small and six large baskets with round things, which probably represent breads and bread rolls and six sacks full of potatoes (again - you can paint them green and turn them into kiwi fruits if you like :-) ). Click on picture to enlarge it. Close-up of various sacks, baskets and crates from the set. There are no air bubbles and all details are very crisply molded. The only flash is inside delicate handles on baskets, but this is inevitable in such places. Removing resin pouring blocks from baskets and sacks should be quite easy, but it can cause more problems in case of crates, as the area of contact of crate bottom with the pouring block is relatively big compared to the size of the part itself. Contents of Goffy set can be a great addition to many dioramas. 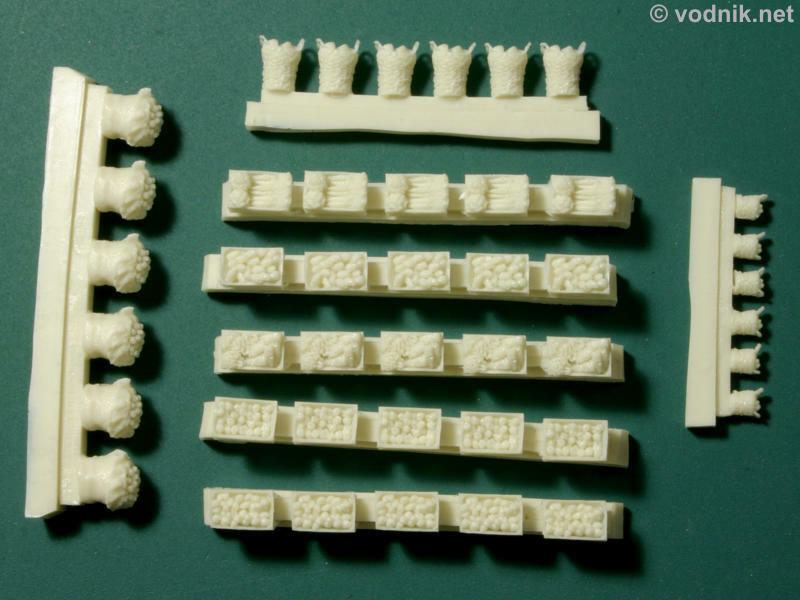 It is almost natural to use it to "equip" a marketplace stand on a diorama, but there are hundreds of other possibilities to use those parts. Highly recommended!